The author is not the recipient of a research scholarship. Background: Smartphone technology and related applications are increasingly prevalent in the field of medicine and ophthalmology, offering a wide range of hand-held capabilities not previously available. While these technologies have enormous potential, many apps are developed without the involvement of qualified professionals leading to concerns about their quality and validity. Aims: To assess iPhone® applications aimed at eye care professionals for qualified professional involvement in their development. Methods: Applications were identified by searching the Apple® (Cupertino, CA) iTunes® Store using the terms ‘ophthalmology’ and ‘ophthalmologist’ in addition to a number of common eye conditions outlined by the Centers for Disease Control and Prevention. Applications were then assessed for category of application, intended audience, documented involvement of medical professionals in application development, price, user rating and date of publication. Results: In total, 152 applications were identified across 12 categories. Applications were found to target eye-care professionals (ophthalmologists and non-ophthalmologists) (32.3%), ophthalmologists specifically (32.3%), non-ophthalmology eye-care professionals (3.3%) and patients (34.2%). Overall, 36 (23.7%) applications had clearly documented professional involvement in their development. Conclusions: There continues to be a low level of professional involvement in the development of ophthalmology based iPhone® applications. This is concerning given the growing prevalence of these technologies and their enormous potential. It is therefore incumbent on clinicians to be informed about the applications they use and promote high quality applications developed with professional expertise. Disclosures: All authors have completed the Unified Competing Interest form at www.icmje.org/coi_disclosure.pdf (available on request from the corresponding author) and declare: no support from any organisation for the submitted work; no financial relationships with any organisations that might have an interest in the submitted work in the previous 3 years; no other relationships or activities that could appear to have influenced the submitted work. Keywords: ‘Ophthalmology’, ‘smartphone’, ‘technology’, ‘ophthalmologist’, ‘telemedicine’. Smartphones are mobile, handheld devices, with functional capabilities similar to those of laptop computers.1 These devices represent a significant technological milestone and provide users with a diverse range of easily accessible, handheld capabilities not previously available. The specialty of ophthalmology has also been impacted by the development of smartphones, with a diverse range of ophthalmology themed apps now available.6 These apps target a wide range of audiences from ophthalmologists and non-ophthalmology eye care professionals, through to medical researchers and healthcare consumers.6, 7 The range of functions typically performed by these apps fall into several broad categories including; clinical examination and assessment tools, medical administration, professional and patient education, and clinical calculators.2, 5–8 The areas of telemedicine and teleophthalmology have also been impacted by smartphones9 with a Brazilian study finding smartphone based photography to be both sensitive and specific in the diagnosis of emergency eye conditions when used as a teleconsultation tool.10 These results are highly promising and have the potential to improve access to healthcare in isolated populations. The Apple® iTunes® Store was searched on Saturday 17 March 2018 to identify ophthalmology related apps. Where appropriate, this study has adopted some of the methodology used previously by Cheng et al.7 in order to facilitate comparisons between the two reports. Apps relating to fields other than human ophthalmology such as veterinary ophthalmology or the physics of light were excluded. Apps were also excluded where the primary purpose was to promote a particular practitioner, conference, institution or product. Similarly, ‘demo’ or ‘lite’ versions of apps were excluded. The following data were collected within the Apple® iTunes® Store based on information provided in the app product description; app name, developer, target audience, description of app function, category of app, cost, iTunes® rating, documentation of medical involvement in app development, year first published or copyright year, and size of the app in megabytes (MB). Professional involvement was defined as clear documentation of medical professional involvement or reputable institutional involvement such as that by a university or hospital in app development. Individual medical practitioners did not need to be identified in order to satisfy this criterion. Information was not sought from external websites, via contacting app developers or within the apps themselves. The data were analysed using descriptive statistics in Excel (Microsoft, Redmond WA). This research was conducted in accordance with the relevant ethical guidelines. No human participants were involved. A total of 152 ophthalmology themed apps were identified with the above search terms. Apps were categorised into 11 categories according to their primary function in addition to a miscellaneous category (Fig. 1). Eleven apps (7.2%) were aimed at providing educational material to all eye-care professionals (ophthalmologists and non-ophthalmologists) and included atlases and written reference material. Five (3.3%) apps were aimed at providing educational material to non-ophthalmology healthcare professionals and included flash cards and quizzes. Eleven (7.2%) apps provided educational material aimed at ophthalmologists specifically and primarily included written reference material. Six (3.9%) apps were electronic versions of academic journals. Eleven (7.2%) apps provided patient education including information delivered in written and multimedia formats. Furthermore, a number of apps provided ophthalmologists with images to be used for patient education such as in the setting of pre-operative counselling. Thirty-seven (24.3%) apps were clinical examination tools and included visual acuity charts, Amsler grids and colour vision testing plates. Twenty (13.2%) apps were clinical calculators of various types including toric and non-toric intraocular lens calculators, glaucoma risk calculators, and visual acuity converters. Twenty-one (13.8%) apps provided treatment for amblyopia and strabismus through games or visual tasks. Seven (4.6%) apps functioned as low vision aids by providing screen magnification or allowing users to change the display colour scheme to better suit those with colour vision deficits. Five (3.3%) apps were aimed at medication compliance, all of which were eye drop reminders. Sixteen (10.5%) apps were categorised under miscellaneous. Apps in this category included an operator simulator, ophthalmology media, clinical administration, social media and telehealth. The apps identified on the iTunes® Store were aimed at 4 different audiences. Forty-nine (32.3%) apps were targeted at ophthalmologists, while 5 (3.3%) and 46 (30.3%) were targeted at non-ophthalmology eye care professionals and eye care professionals (ophthalmologists and non-ophthalmologists), respectively. Fifty-two (34.2%) apps were targeted at patients. Forty-two (27.6%) apps had five or more user ratings resulting in them having an overall rating on the iTunes® Store. The mean rating amongst these apps was 3.4 stars. In contrast, 110 (72.4%) apps did not have an average user rating provided as they had been rated less than 5 times. In total, 36 (23.7%) apps had clearly documented medical involvement, or were developed by a reputable organisation such as a hospital or university. There were 34 (22.4%) apps that were assumed to have medical or professional input into their development because of their content or presentation, however they did not explicitly state this. A total of 82 (53.6%) apps had no professional involvement in their app development (Tab. 1). The number of apps produced each year from 2009 to 2018 (inclusive) was; 3 (2.0%), 8 (5.3%), 15 (9.9%), 10 (6.6%), 15 (9.9%), 18 (11.8%), 29 (19.1%), 20 (13.2%), 23 (15.1%) and 11 (7.2%) (Fig. 2). The 2018 figure of 11 represents the number of apps produced until 17 March 2018 when the search was conducted. The mean and median price of apps was USD$5.25 and $USD0.00, respectively. The price of apps ranged from USD$0.00 – USD$99.99. Eighty-nine (58.6%) apps were free while 8 (5.3%), 11 (7.2%), 7 (4.6%), 19 (12.5%) and 19 (12.5%) apps were USD$0.99, USD$1.99, USD$2.99, USD$3.00 – USD$10.00 and >USD$10.00 respectively. This report provides an update on the involvement of medical professionals in the development of ophthalmology apps available through the Apple® iTunes® Store. 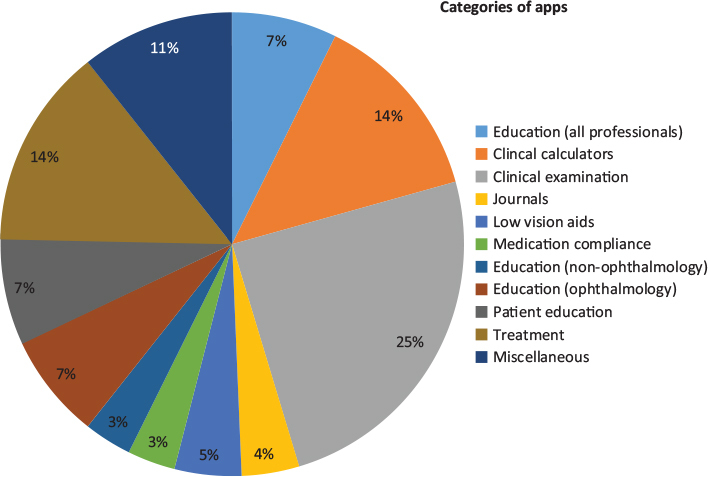 A similar report published in 2014 identified a total of 182 ophthalmology themed apps compared to 152 identified in this report,7 however significantly broader search terms were used in this previous study. As such, these results likely confirm that there are an increasing number of ophthalmology apps available. This is supported by the significant increase in number of ophthalmology apps released each year. 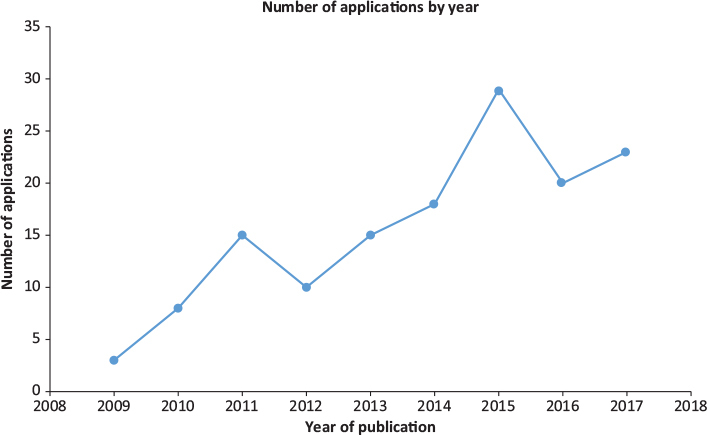 While three apps were released in all of 2009, 11 apps have already been released as of 17 March 2018 highlighting the rapid growth in ophthalmology themed iPhone® apps over the past decade. A broader number of app categories were identified in this report compared to those identified in previous studies.7 Examples of these new categories include low vision aids, those targeting medication compliance in the form of eye drop reminders and apps that provide treatment for strabismus and amblyopia. Clearly documented professional involvement or clear documentation of reputable institution involvement in app development was low, with only 23.7% of apps fulfilling these criteria. These findings are considerably lower than figures quoted in previous studies.7 This is especially concerning given the very low standard required to meet these criteria. For example, merely stating that there was doctor involvement was sufficient with no requirement to provide evidence for these claims. Additionally, simply having medical involvement in app development does not in any way validate an app against non-iPhone® standards. It is not within the scope of this report to assess the validity of all available apps however. When combined with those apps that were assumed to have professional involvement this figure rose to 46.1%. While a lack of professional involvement in some categories such as eye drop alarms may be benign, in other categories of apps it may be dangerous. For example, almost 86% of apps that aimed to provide ‘lazy eye training’ in the setting of amblyopia and strabismus had no professional involvement in their development. These apps primarily consisted of games and superficially they may appear harmless, however they may represent an opportunity cost and deny patients of time spent performing proven treatments. This highlights the need to validate these apps to avoid adverse outcomes. Additionally, apps that provide visual assessment tools such as visual acuity or colour vision testing may provide clinicians and patients with false information if improperly designed. Such limitations have already been identified within the literature. A 2015 report by Perera et al. investigating the validity of iPhone® based visual acuity charts failed to identify a single app of sufficient accuracy for clinical use16 while discrepancies between iPhone® based, and standard Ishihara charts have also been documented.17 These findings are particularly concerning given that clinical examination apps account for approximately one-quarter of the app market and have the potential to directly lead to clinical errors and adverse outcomes. While the large number of free apps available may seem beneficial, it may have the effect of promoting the development of poor quality apps due to lower standards expected and tolerated by users. Additionally, the large number of apps aimed at non-ophthalmologists may also promote poor development given that this target audience is likely to lack the expertise needed to critically appraise the technology. These findings are a significant concern given the growing prevalence and influence of smartphone technology in medicine and ophthalmology.2–5 With the exception of a few, current smartphone apps are poorly designed, lack evidence to support their use and as such, the technology is not reaching its full clinical potential. Despite this, it seems highly unlikely that ophthalmology based smartphone technology will not continue to grow and offer an ever increasing range of functions. As such, it is incumbent on clinicians to promote high-quality, evidence-based apps where possible in order to derive maximum benefit from this technology, whilst avoiding the inherent pitfalls. This report provides and an up to date review on the quality of ophthalmology iPhone® app development with the results highlighting the low level of professional involvement in this process. This is concerning given the growing prevalence of these technologies and their enormous potential. It is therefore incumbent on clinicians to be informed about the applications they use and promote high quality applications developed with professional expertise. 1. BinDhim NF, Freeman B, Trevena L. Pro-smoking apps for smartphones: the latest vehicle for the tobacco industry? British Medical Journal. 2012;23(1):e4[1–8]. 2. Mosa AS, Yoo I, Sheets L. A systematic review of healthcare applications for smart phones. BMC Med Inform Decis Mak. 2012;12(67). 3. Epocrates. 2013 mobile trends report [Available from: http://www.epocrates.com/oldsite/statistics/2013 Epocrates Mobile Trends Report_FINAL.pdf. 4. Kulendran M, Lim M, Laws G, Chow A, Nehme J, Darzi A, et al. Surgical Smartphone Applications Across Different Platforms: Their Evolution, Uses, and Users. Surgical Innovation. 2014;21(4):427–40. 5. BinDhim NF, Trevena L. There’s an App for That: A Guide for Healthcare Practitioners and Researchers on Smartphone Technology. Online Journal of Public Health Informatics. 2015;7(2):e218–5. 6. Zvornicanin E, Zvornicanin J, Hadziefendic B. The Use of Smart Phones in Ophthalmology. Acta Inform Med. 2014;22(3):206–9. 7. Cheng NM, Chakrabarti R, Kam JK. iPhone applications for eye care professionals: a review of current capabilities and concerns. Telemed J E Health. 2014;20(4):385–7. 8. Bastawrous A, Cheeseman RC, Kumar A. iPhones for eye surgeons. Eye. 2012;26:343–54. 9. Grisolia ABD, Abalem MF, Lu Y, Aoki L, Matayoshi S. Teleophthalmology: where are we now? Arq Bras Oftalmol. 2017;80(6):401–5. 10. Ribeiro AG, Rodrigues RA, Guerreiro AM, Regatieri CV. A teleophthalmology system for the diagnosis of ocular urgency in remote areas of Brazil. Arq Bras Oftalmol. 2014;77(4):214–8. 11. Abroms LC, Padmanabhan N, Thaweethai L, Phillips T. iPhone Apps for Smoking Cessation: A Content Analysis. American Journal of Preventative Medicine. 2010;40:279–85. 12. Gan SK-E, Koshy C, Nguyen P-V, Haw Y-X. An overview of clinically and healthcare related apps in Google and Apple app stores: connecting patients, drugs, and clinicians. Scientific Phone Apps and Mobile Devices. 2016;2(8). 13. BinDhim NF, Trevena L. Health-related smartphone apps: regulations, safety, privacy and quality. BMJ Innovations. 2015;1(2). 14. Birbeck GL, Wiysonge CS, Mills EJ, Frenk JJ, Zhou X-N, Jha P. Global health: the importance of evidence-based medicine. BMC Medicine. 2013;11(223). 15. Centers for Disease Control and Prevention. Common Eye Disorders United States of America: CDC; 2015 [Available from: http://www.cdc.gov/visionhealth/basics/ced/index.html. 16. Perera C, Chakrabarti R, Islam FMA, Crowston J. The Eye Phone Study: reliability and accuracy of assessing Snellen visual acuity using smartphone technology. Eye (Lond). 2015;29(7):888–94. 17. Sorkin N, Rosenblatt A, Cohen E, Ohana O, Stolovitch C, Dotan G. Comparison of Ishihara Booklet with Color Vision Smartphone Applications. Optometry and Vision Science. 2016;93(7):667–72.